Top university officials faced criticism following the release of an independent report analyzing Stony Brook University’s finances at a University Senate meeting on Monday, March 4. The report concluded that, contrary to previous claims made by higher ups in administration, Stony Brook University was actually in good financial standing. University officials contested this conclusion. They claimed that the report was missing certain crucial details which skewed the results. Repeated claims of a structural deficit from the university’s administration prompted a group of professors to pool their money and commission an outside assessment of the university’s finances. They hired Howard Bunsis, a professor of accounting at Eastern Michigan University who has previously analyzed the finances of Rutgers University, Oregon State University, Washington State University and more. Axel Drees, co-chair of the Senate Committee on Academic Priorities and Research Activities (CAPRA) and chair of the department of physics and astronomy presented Bunsis’ findings to the audience. The report examined the school’s net cash flow — the difference between the money the university brings in and what it spends — and its unrestricted reserves — money that does not have a designated spending purpose. 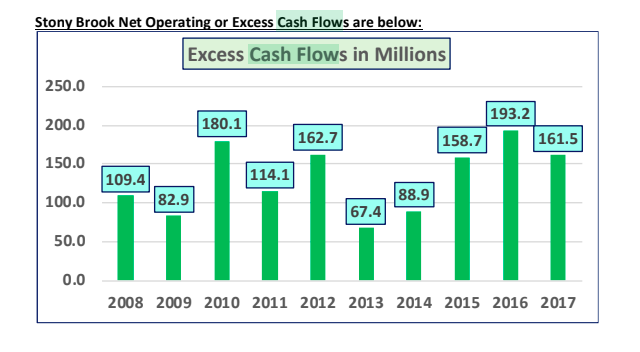 The report discovered that Stony Brook has had a positive net cash flow for the past 10 years. According to the report, the university had $423.6 million in unrestricted reserves in 2017, up from $375.1 million from 2016. 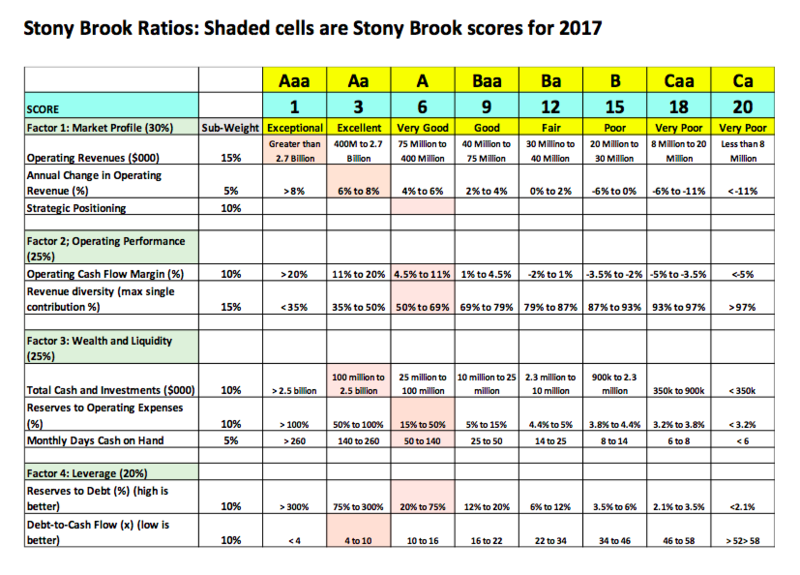 Bunsis also gave Stony Brook a hypothetical bond rating based on the criteria used by Moody’s, a financial services company (Stony Brook does not have an individual Moody’s bond rating because the SUNY system is rated as a whole.) 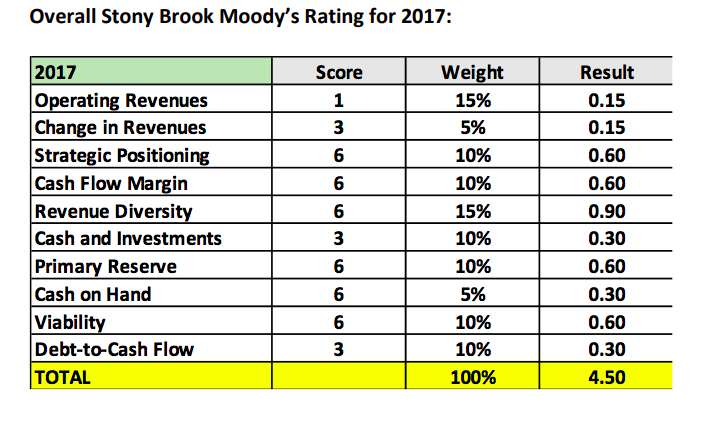 Bunsis reported that in 2017, SBU would have received an Aa3 rating, which is on the higher end of the Moody’s scale. The report found that the university’s revenue and expense growths have increased at nearly equal rates. “The expenses were $1.2 billion in 2017. They have increased by about $300 million over the past 10 years. The revenues were similar. $1.2 billion, and increased also by $300 million,” Drees said. Kathleen Byington, the senior vice president for finance and administration, expressed skepticism about the results of the report. She gave her own presentation on the budget and tried to address some of the issues with Bunsis’ analysis. 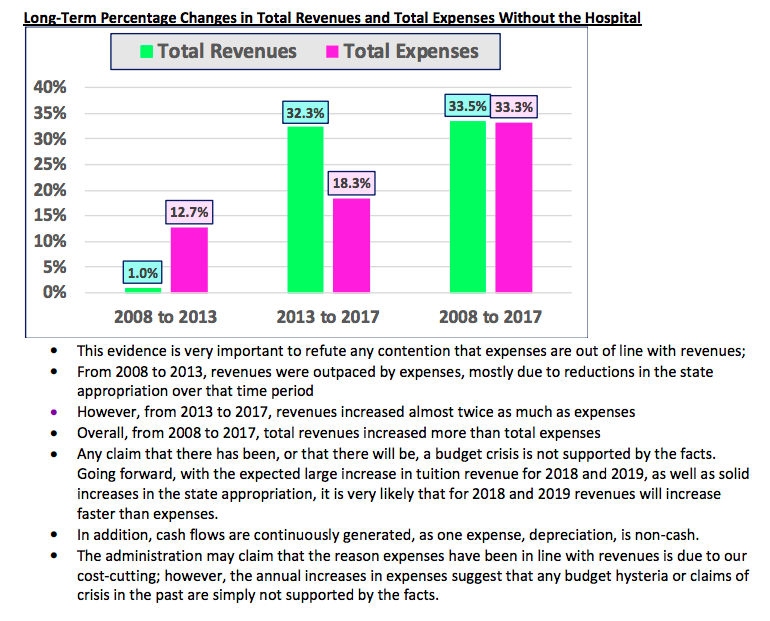 Byington explained that although Bunsis excluded the hospital’s finances in his analysis, he still included the university’s total state appropriations, some of which are used specifically to fund the hospital. 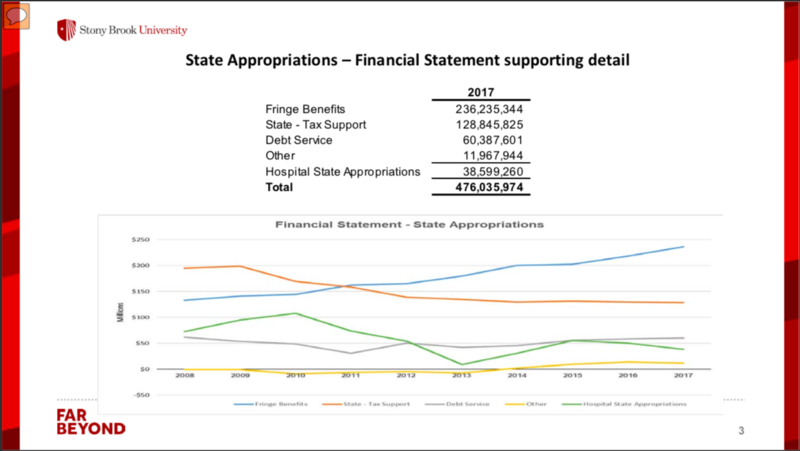 “If you’re going to exclude the hospital when you talk about the budget of the university, you would need to exclude these appropriations,” she said. Byington then discussed how Stony Brook ended up with a structural deficit in the first place. “In fiscal year ’17, that $409.6 million revenue that you had? You spent $8.7 million more than that in that year,” she said. In the ’17-’18 academic year, several faculty members were let go in order to reduce overhead. The university also implemented a hiring freeze in hopes of cutting costs through attrition. Byington said that the next logical step for the university would be to focus less on implementing austerity measures and more on making sure the budget aligns with its values as an institution. Byington congratulated the Senate on the hard work it has done to set the university on a path toward financial stability. Peter Manning, a professor in the English department, took issue with this characterization. Several attendees, including Thomas Wilson, an instrument engineer in the School of Marine and Atmospheric Sciences, felt that Byington’s report did not give the fullest and most accurate picture of the university’s finances, since she presented total revenues and total expenses rather than breaking them down into more specific categories. “If we’re going to have shared governance, shouldn’t we have deep transparency into what the money’s coming from and where the money’s going?” he asked. Distinguished Professor of History, Kathleen Wilson, chastised the university for misappropriating funds. Byington appeared unfazed by the senators’ demands, maintaining a cheery demeanor throughout the meeting. “Those aren’t questions that I have the answers to today, so I’d be happy to come back and provide the answers,” she told the increasingly disgruntled crowd. President of the University Senate and Distinguished Professor of History, Nancy Tomes, assured the audience that this would not be the last they’d hear of the Bunsis report.